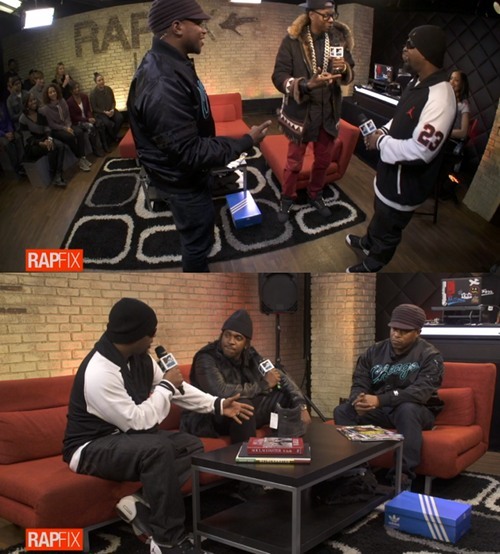 It was a case of real recognize real when Tech N9ne stopped by to kick it with Sway and some elite company on MTV’s RapFix. Perhaps the highlight of the proceedings wasn’t even Tech’s interview with Sway but the respective vibe sessions that occurred between Tech and fellow guests 2 Chainz and Pusha T. Both of the hip hop heavyweights had nothing but praise for Tech N9ne, not as much for his elite emceeing ability but for his pioneering business savvy. WATCH below as 2 Chainz throws out the quotables “Ask this man how much money he has!” and admonish Tech for investing in Strangeland Studios. Tech also touches on the upcoming Strangeulation project. WATCH as Pusha T makes his appearance. Sway makes sure to sit them both on the same throne as “Your favorite rappers’ favorite rappers.” The two lyrical monsters ask each other questions, Tech asks about a prospective Clipse album and Pusha T asks Tech about his business sense. Click here to watch the entire episode and catch interviews with August Alsina and Cap 1. Watch til the very end to see Cap 1 rip the acapella freestyle to shreds. – What did you think of Tech’s interactions with Pusha T and 2 Chainz? – Would you like to see a Tech N9ne Pusha T collaboration?